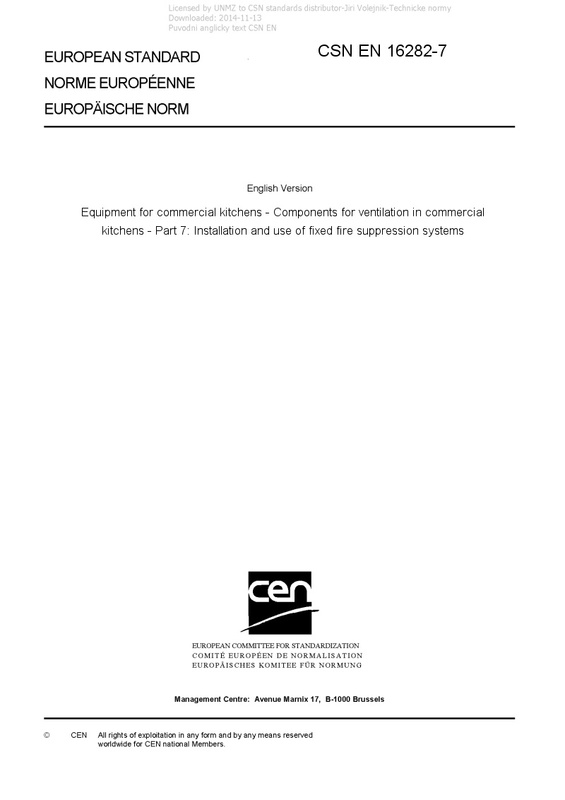 EN 16282-7 Equipment for commercial kitchens - Components for ventilation in commercial kitchens - Part 7: Installation and use of fixed fire suppression systems - This European Standard specifies requirements and gives recommendations for the design, installation, testing, maintenance and safety of kitchen fire suppression systems in buildings. This European Standard is applicable to ventilation systems in commercial kitchens, associated areas and other installations processing foodstuffs intended for commercial use. Kitchens and associated areas are special rooms in which meals are prepared, where tableware and equipment is washed, cleaned, food is stored and food waste areas. This European Standard is applicable to fire suppression systems except those used in domestic kitchens or industrial food processing facilities. Unless otherwise specified, the requirements of this standard should be checked by way of inspection and/or measurement. NOTE Please note the possible existence of additional or alternative local national regulations on installation, appliance requirements and inspection, maintenance and operation.